Rats in Action is an organization that started in 2010 with the main goal of educating people within South Africa, more specifically the Gauteng province, with regards to the correct care for small animals generally regarded as "feeder animals", more specifically rats. RIA was started by 2 avid rat lovers based in Pretoria. Both Lindi and Michelle have owned rats for several years and have gone to extensive lengths to research and learn more about these amazing creatures. RIA's target market will be pet shops who sell rats and other feeder animals, vets and feeder breeders. 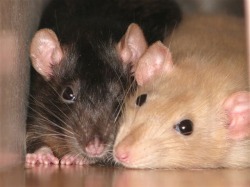 Along with their partners, such as the Rat Fan Club and Ratty Rascals Rescues, RIA will provide a support and knowledge base for rat owners in SA who want to learn more about keeping their pets happy and healthy. We would like to send out a special thank you to Caryn and Tails for providing us with beautiful pictures of their gorgeous ratlings for the site, our pamphlets and logo. And to Maureen and the FabRATS from the Rat Fan Club for their continued support and guidance in our efforts to make this a better province for all ratties!